There are many reasons you may want to find a new dentist. Often this can be an overwhelming process. None of us want to make a mistake that could create a problem with our teeth or have work done that isn’t done right and just won’t last. Here are 10 tips that you should consider when looking for a new dental practice. How long has the practice been established? A practice that has been in business for a while is a good sign. If they have been around for a long time are they running excessive advertisements? If they are running lots of advertising, you may ask yourself why? Reputation is a must. Ask friends and family about someone you are considering. What kind of procedures does the dentist do? Do they meet your needs? For example, some dentists don’t do veneers, root canals or offer limited services. Technology- Do they have the technology to keep them up to date on the latest procedures. Technology such as a dental scanner can make your visit quicker and easier while providing a higher quality restoration. Ask to see examples of their work. If you are considering work even as simple as a filling, the dentist should be able to show you pictures of work he has done. This is especially true in cosmetic dentistry. 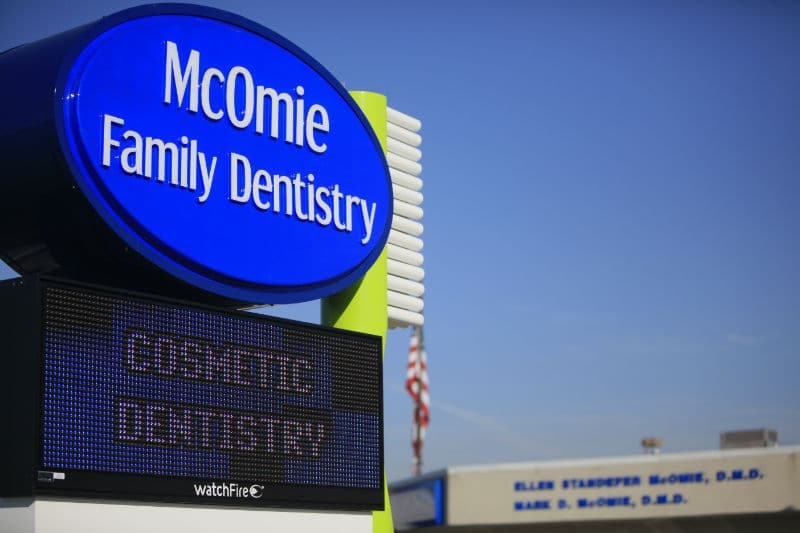 Here at McOmie Family Dentistry Dr. McOmie has thousands of pictures he loves to show patients. Implants, Crowns, Veneers, Bridges, Bonding you name it they can show you pictures of their work. After all, you are purchasing this procedure, right? Would you purchase anything else without being able to see it first? Ask about the professional dental societies and organizations the doctor participates in. Some societies require dentists to take continuing education classes to keep them up-to-date on the latest procedures and technological advances in the field. Is the dentist a part of the dental community in the area? Inquire about the type of emergency care offered. For example, is the practice open after hours and on weekends? If you call after hours who do you talk to? Is the dental team friendly and courteous? Are they friendly on the phone when you call? You may not want to see a dentist long term if you don’t feel comfortable with the dentist’s team. Also, a staff that has been with the practice for many years may point to a stable, happy office, making a happy place to visit. Are appointments available to you when you need them? Is the practice booked out so far in advance that it is hard to get into see the dentist? Ask what happens if you call with an emergency? Insurance and dental benefits. Does the dentist take your dental insurance? Do you have insurance with a list of “participating providers” if you do and you want to use your insurance? Ask if the office can help you find out about your insurance. Insurance is one of the most confusing things we deal with is the office willing to help sort through it with you? So now that we have posed these questions about finding a new dentist we would like to answer them. How long has the practice been established? McOmie Family Dentistry was established By Dr. Mark, and Dr. Ellen McOmie is 1998. They have been in this location since 1998 and have built a world-class facility providing state of the art care for their patients, using the latest technology and techniques. Dr. Mark McOmie actually started working in the dental industry as a dental laboratory technician in 1992. As you can see, they have been serving the Chattanooga area for a long time. Reputation is a must. Did you know we are THE most reviewed practice on Angie’s List! We have an A+ rating on Angie’s List; you can’t buy the reviews on this service like you can others. Also, we are the ONLY 5 star reviewed dental practice in Chattanooga on Google! Speaking of Google, we have the second most reviews in Chattanooga. Dr. Mark and Ellen are active in the community as well Dr. Ellen has been on the Cystic Fibrosis Board for years. Dr. Mark has held offices in The Southern Off-Road Bicycle Association (SORBA), and offices in Scenic City Velo as well. They are both active in many other groups too numerous to name. What kind of procedures are done. At McOmie Family Dentistry both of our doctors are very skilled at comprehensive dentistry. Our patients range from 3 to 96 years of age. We do dentistry procedures in Implant placement, Root Canals, Cosmetic Dentistry, Restorative Dentistry, Cleanings, Preventative Dentistry just to name a few. Our doctors do more procedures than an average dentist does, they have received advanced training in many, many areas of dentistry over the years. As a result, they can offer a wide variety of services. Technology. This is an area we excel in. Our office has been on the front edge of technology from the beginning. This keeps things fresh and excited always offering more ways for our patient’s dental needs. Ask about this when you come in we would love to show you our latest scanners, x-ray, sterilization, crowns, etc. Ask to see examples of their work. Both Dr. Mark and Dr. Ellen McOmie would love to show you their work. They have folders and folders of thousands of pictures of their work where patients have given permission to show others. Careful about this sometimes they get so excited showing you cases you will have a hard time getting them to stop. 🙂 They can show you implant cases, veneers, crowns, bridges, dentures, partial, fillings, bonding, etc. Professional Societies. Both Dr. McOmie’s have been members of the American Dental Association (ADA) since they were in dental school in the 90’s. They are still members of the ADA, Tennessee Dental Association (TDA), and Chattanooga Area Dental Society. They have both held many offices in these associations. Dr. Mark is a Fellow of the American College of Dentists, and a Fellow of the International College of Dentists, he was recently inducted into the Pierre Fauchard Academy. Emergency Care. Believe it or not, EVERY patient is given Dr. McOmie’s cell phone number. Yes the real cell phone that HE answers anytime you call. If there is an emergency or after hour need you can talk to the dentist. How many other doctors have you heard of that do that? Friendly dental team members. We have a great staff, they have been here for years. One of the biggest attributes of this office is our caring staff. If you read our reviews, you will see in almost everyone the team is named. Are appointments available. With two dentists and three hygienists, we can always work in an emergency if needed. We can get you an appointment within a few days in most cases for non-emergency care. Insurance and dental benefits. We have three staff members at our front desk to serve you. One of their primary jobs is to help the patients wade through the puzzling maze that dental insurance can be. Every new patient visit we call your insurance for you and offer treatment plans that show what is covered by the insurance. This gives us the unique opportunity to really help you understand the cost and make decisions on treatment. Still not sure? Give our office a call and let one of our insurance specialists help you find out about your dental insurance. Give us a try. If you are looking for a new dentist look no further. At McOmie Family Dentistry we want to be your dentist, and we will do what it takes to make you comfortable and earn your trust. Give us a call today to experience the best dental appointment of your life. McOmie Family Dentistry (423) 899-1112.